Among my favorite things to eat during the hot summer months are yummy cold salads. Last Sunday, we spent the afternoon making several cold salads to eat during the week. Here is one of the salads we made, which is a favorite. 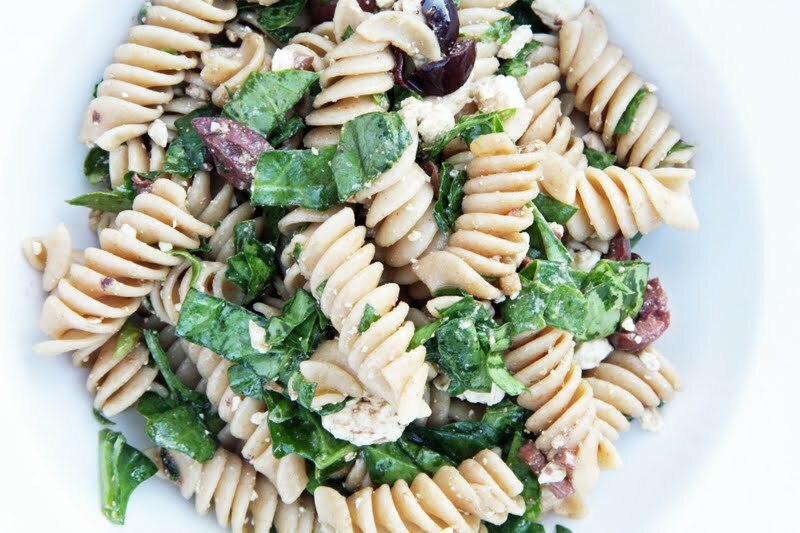 Its ingredients are simple: whole wheat pasta, chopped spinach, feta and kalamata olives. So fresh, so tasty...we eat it as a side salad but it can also be served as a light main course. Combine cooked pasta (cooled), spinach, olives and feta. Toss with the dressing, which combines the olive oil, balsamic and garlic. I made up a lovely summer salad last night too- watermelon, feta and red onion with lime juice. Unfortunately, here in Ireland we dont' have the hot steamy summers you do in the states but I still have to make this salad! Yours look delicious- anything with feta makes me happy! That looks delicious. I will have to make that up this weekend. Yum! Love all the ingredients. Will definitely make this one. That's 1/2 cup of crumbled feta, correct? Trina, this looks so yummy... I found you over at Sherry's blog and glad I did.. I am your newest follower.. Your home is to die for... Love the inside and outside.... And the kitchen WOW....what a lovely place to cook.. This looks so wonderful! I love cold salads in the summer, but I have rotated through my "go to" salads. There might be an uprising if we serve black bean salad.one.more.time. Thanks for the new cold salad in the mix! We had dinner at neighbor's house a month ago and they served a very similar salad... it was scrumptious! looks great! i'm going to have to try this! Hi there, This is one of my favorite salads too. If we weren't have the grands over tonight for spagetti I'd probably make this. Last night I made a big salad, with chicken but put Southwestern Style Corn(canned)and it was wonderful. I'd never tried the corn before but had gotten it for another Mexican dish, I love it. Have a great afternoon. Looks yummy Trina and I think even I can handle this one. ;) I'll try it out next week. Just finished making your salad. Yum! It made a great lunch alone and I will use it as a side dish again tonight with Hubby. Thanks! Now that summer finally seems to be here...this sounds absolutely perfect...so summery! Sounds delicious...your photos are amazing. I am with you, I love them! One week we made a huge one and ate it every night. No one to complain since that week it was just hubby and I! Delightful recipe ~ thank you! Trina and family: You had me at the picture! This salad will be on my menu this weekend. Thank you for sharing. Mixed greens , cherry tomatoes, red onion diced and smoked salmon .. lemon and oil , salt and pepper. DeLiSH!! My stomach is growling, and it is only 10:00 am!! Whoa...not sure how I ended up at your blog, but happy to be here. 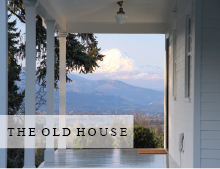 Your home is stunningly classic and timeless. Love it. Can't wait to see Christmas in July!! Wow! That sounds great! Thanks so much for sharing. Made this last night for visiting family - soooo good! My mom and sister both asked for the recipe. Thank you for sharing! Yum this is right up my alley. I think I am making it this week. You have given me an idea on what to cook while here at the beach, on vacation. Making this tonight, thank you!